WATCH D.O.G.S. ® is an innovative program being used by schools across America which helps them to be positively impacted by the committed involvement of fathers and father-figures in their student’s life. Studies by the U.S. Department of Education have demonstrated that a positive adult male role model will have a uniquely positive impact on the development and educational success of a child. Dramatically increasing the child’s likelihood of graduating and getting mostly A’s along the way, while at the same time dramatically decreasing the likelihood of that child living in poverty, getting involved with drugs and alcohol, and avoiding potentially devastating choices that result in a criminal record or a teen pregnancy. The U.S. Department of Education has identified the WATCH D.O.G.S program as an effective way to increase male involvement in our nation’s schools. Schools gain an extra set of eyes and ears. The presence of Watch DOGS (Dads Of Great Students) can increase a sense of security at the building for students and staff, and it helps create an environment conducive to learning. -You will patrol the halls as an extra set of eyes around the school and also be outside during lunch recess time. -Most importantly be around the school, say ‘Hi’ to the kids, and be a male role model around the school for our kids to look up to. Our goal this year is to have 60% of the school days covered where a WATCH DOG dad is in the school. I think we can hit this goal and most likely even succeed it. With that being said, I highly encourage all of you to go online to our sign up genius page and sign up for any days that you are able to volunteer. Here is our sign up genius link, once you click on the link you will need to register and then select the date or dates you want to sign up for and enter the information. If you have any issues or do not have access to sign up online please e-mail me and I can get you signed up for the days you are able to volunteer. We also encourage dads to purchase a WATCH DOG t-shirt from the WATCH DOG store to wear on the days you volunteer. If you would like to purchase a shirt please click on the link and select and shirt style that you prefer. Shirts are not required so if you prefer not to purchase a shirt we will provide you a WATCH DOG vest the day you volunteer. The Bremerton Patriot featured a great article about the Watch D.O.G.S. (Dads Of Great Students) volunteer program. Its a great opportunity for our dads to have a positive influence in the lives of our kids. 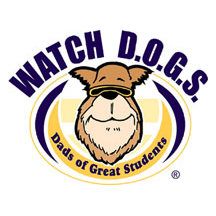 WATCH D.O.G.S.®, a K-12 program, invites fathers, grandfathers, uncles, or other father figures to volunteer at least one day, all day at their child’s/student's school during the school year. Individuals sign up at a kick-off event such as a “Dads and Kids Pizza Night” or “Donuts with Dad” or in the office at any time throughout the school year. The program is overseen by a “Top Dog” volunteer who partners with the school administrator to coordinate scheduling and identify opportunities for Watch DOGS to provide assistance at the school. Watch DOGS volunteers perform a variety of tasks during their volunteer day including monitoring the school entrance, assisting with unloading and loading of buses and cars, monitoring the lunch room, or helping in the classroom with a teacher's guidance by working with small groups of students on homework, flashcards, or spelling.